Never used to have a favourite film. Never felt the need. Amongst the many reasons for watching old films are the obvious pleasures of intellectual and emotional stimulation, the worthy ones of education and exploration, and the guilty ones of camp and nostalgia. On rare occasions, however, another form of cinesthesia presents itself, the discovery of the path not taken: the abandoned innovation, the technical or aesthetic or narrative course only just started upon before the juggernaut of film history turned another way. He Who gets Slapped is a Hollywood film of a Russian play, made by a Swedish director – the great Victor Sjöström, star of Bergman’s Wild Strawberries (1958). It is also the first film made by the newly formed Metro-Goldwyn-Mayer. These are all good historical reasons for studying it, and for expecting something special. Sjöström is here paired with Lon Chaney, the silent era’s greatest character star, and a master of the grotesque. The director reins in Chaney’s excesses and coaxes from him an eloquent, restrained, yet hugely powerful performance. It’s worth remembering what a fine and subtle actor Sjöström himself could be – there’s a moment in his film The Phantom Carriage (1921) where he laughs contemptuously… he doesn’t throw his head back, or clutch his sides, or do anything except grin – and yet I swear I can hear that laugh. Chaney plays Paul Beaumont, an aspiring scientist who loses everything in one horrific day – his theories are stolen, he is disgraced before his peers, and his wife scorns him in favour of the man who robbed him. Each horror culminates in a slap to the face. Beaumont cracks, begins to laugh, and the next time we see him he’s employed as a circus clown and known only as HE. And then the film’s true story begins. Chaney is in love again, with a beautiful equestrienne (a young Norma Shearer). But she’s in love with a handsome young circus star (John Gilbert, NOT looking good in tights), but her sleazy father is about to promise her hand to… but I won’t give it away. Over the course of the narrative, HE will face his original trauma once more, for real, and overcome it, after a fashion. How can I describe the impression this story made on me? I didn’t believe Chaney had any scientific theories (the film is very coy as to what they might actually be) or that he would suddenly become a circus clown as a result of a nervous breakdown. The film continued to pile improbabilities on top of these, and yet I was utterly gripped. Sjöström was creating intense, emotional drama from a story that would hardly fool a child. Unlike in Chaney’s work with Todd Browning, where lunatic plots are part of the hysterical appeal, the kind of deeply serious melodrama found in He Who gets Slapped should not have been sustainable without some suspension of disbelief: how do you care for a character whose life is a series of absurd contrivances? And yet I did. I do. And so will you. Freud once remarked that Chaplin was a simple case: a rich man driven to endlessly replay the trauma of poverty by dressing as a tramp. As usual, Freud was mistaken, at least partly: Chaplin quickly tired of his tramp persona but was compelled by the public to maintain it. 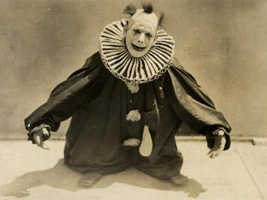 But Chaney’s character, HE, obsessively revisits his own trauma, re-enacting the slap that ended his first life, again and again, for the delectation of the circus audience. As an exploration of emotional masochism, He Who gets Slapped is an extraordinary work, far removed from the romantic glitz MGM would make its stock-in-trade. Beyond the film’s bizarrely powerful narrative and tantalising psychological undertones, there’s the technique. Sjöström was master of the match-dissolve, where one image bleeds into another, creating an expressive juxtaposition. In his last film as director, Under the Red Robe (1937), the image of a noose melts away to a close-up, framing the incoming face through the loop of rope. Here, Sjöström produces numerous startling mixes, each redolent with meaning, especially when he segues from a spinning globe to a circus ring, perfectly framed so that the edge girdles the earth like Saturn’s rings. It’s a stunning moment, reiterated at the film’s end, where an intertitle dares pose the questions “What is love? What is life? What is the world?” Sjöström proceeds to ANSWER those questions, with a single image. This dreamlike blending of image with image and image with word, and this near-Brechtian, proto-Godardian form of melodrama (exposing the artifice of narrative while preserving the emotion), together point towards a kind of cinema we can imagine dominating all future Hollywood output, yet it is a revolution that never happened. This slapstick tragedy offers a flickering glimpse of a whole alternative history of movies. While Sjöström made remarkable films both in his native Sweden and in Hollywood, He Who gets Slapped stands alone in its weirdness and experimentalism. The Wind (1928) is a masterpiece, a blending of drama and horror, illustrating Sjöström’s very Swedish fascination with the harshness of nature. The proposed original ending, changed by the studio, would have reprised the climax of his earlier The Outlaw and his Wife (1918), with the heroine wandering off to die in a storm. Few filmmakers have used the natural world as a character in their work with such conviction and passion as Sjöström. Yet in He Who gets Slapped, his finest film, nature has only a walk-on part. When the young lovers picnic, nature seems tamed and romantic – until we are granted a glimpse of their food, abandoned by them as they kiss: it is crawling with flies, a potent symbol of the corruption around them, but also of the world’s indifference to human affairs. Rather than using landscape to evoke the vast apathetic universe, Sjöström uses the microcosm of the flies, of the circus ring, and the image of the spinning globe itself. And in one famous scene, Chaney stands in extreme long shot in the circus ring as the lights go out one by one, until only his white face is left, tiny in the darkness, glowing like a planet in the vastness of space, until a slow fade to black snuffs it out. This film is unique in MGM’s output, unique in its director’s work, unique in film history. It’s the film that tells us what life is (with a single image! ), the film that matches the laugh of the clown to the snarl of a lion, and the film that creates a great love story from a tale as artificial as the whiteface makeup of a clown. David Cairns is a struggling writer and director. His comedy Cry for Bobo has won 23 prizes around the world but he still needs a job.